The feeling I had festering in the pit of my stomach, could best be described as tempered anxiety, the anticipation of things to come, pressured by the hope that for the sport, this would be his first black bear. As a guide, you do all you can to prepare a bait site and brief your client but in the end, it is ultimately up to the sport to pull the trigger and make a clean ethical shot. This plot line, creates a feeling in guiding professionals, not unlike what parents experience sending their children off on their first day of school. Unlike with a normal bear hunting scenario, this bait location was complicated by a conscientious observer. The sport was accompanied by his wife who was planning to video tape her husband. This meant that two separate stands would need to be installed to accommodate both individuals. Adding further to the complications, were the obvious facts that two individuals double the chances that some small detail will be missed. Tops on this list are of course, scent control and movement, two of the fastest ways to make a comfortable bear leary. Parking the truck about a 1/2 mile away, I turned on the walkie in preparation of the excited "bear down" call that I had high hopes of soon receiving. Though it was only the first day of this week long adventure, there is still something distinctly gratifying about your sport harvesting a bruin on the first evening. The hours of waiting were spent reading, making hunting knives shapah (yes, that is how you spell it and say it in Maine!) and writing this story on my Blackberry, all desperate attempts to keep my mind from wandering to thoughts of how their evening was progressing. I had high hopes that even if they weren't seeing bears, that at least they were comfortable and enjoying the rugged beauty of Maine's flora and fauna. As the day faded into evening and was finally enveloped in darkness, no shot indicated they had not encountered a "shooter" sized animal. Upon picking up the wide eyed sports, I was gratified to find they had great video of a smaller (110 lb)bear working the bait site but had ultimately passed on taking the animal with hopes that a larger bear would present itself before weeks end. In reviewing the video, it appeared to be an average sized bear but some choose to roll the dice, determined to take their chances at scoring a truly massive animal. For them, time would tell if they had played their cards correctly. On Tuesday evening at 6:00 a call from another guide came over the VHF indicating that a 300 lb plus class bear had just strolled across the road heading directly for my sports bait site. Unfortunately, the paths of the bear and the hunter did not cross and another evening slipped quietly past. Wednesday presented itself and my conversation with the sports indicated that if the 110 lb returned they would take the shot. As I settled the sports into their stands, my confidence was running high. Though the bear had failed to show, the previous evening, the bait site was cleaned out daily, indicating that it would only be a matter of time before he returned during legal hunting hours. As Jimmy Buffet sang "Margaritaville" for an annoying 11th or 12th time, that sweltering afternoon, a single gun shot, from the clients .30-06 Springfield, suddenly shattered the songs mellow chorus line and I fumbled for the walkie. Checking the walkie volume 3 or 4 times in as many seconds, I forced myself to take a deep breath and wait. Moments seemed to crawl by, making me exponentially more and more nervous. Finally after what seemed like hours, a heavily garbled voice crackled from the speaker, "bear at pebble!". Jumping in the cab, I hit the accelerator hard enough to throw loose gravel into southern Maine. Rocketing down the dirt road, spruce trees blurred and I silently prayed that there would be no close encounters of the moosey kind. Arriving, I was pleased to see that, despite the adrenaline rush, the sports were still in their tree stands as instructed. I asked them if the bear was down and they indicated no. I next asked where the bear was shot and to point me in the general direction the animal ran. Tracing a blood trail as wide as a two lane highway, it didn't take long to find the bear heaped up by an old stump. With my hand tightly gripping the handle of my hand gun, I slowly approached the downed animal watching carefully to see if he was still drawing breath. Convinced that he was most likely dead, I cautiously approached and gave him a firm kick. Getting no response, I tapped his open eye with a long stick and seeing no blink was finally satisfied that I could pronounce the animal dead. As all hunters realize, after the shot has been fired, the real work begins. Any large game animal is a chore to extract from the woods and perhaps the number one reason to have on your side the services of a registered Maine guide. Possessing extensive tracking skills, the resources and equipment necessary to effectively and safely get a downed bear out of the woods and ultimately to the dinner table, securing their services is for the uninitiated a wise investment. For anyone interested in bear hunting, I strongly encourage you to look at Eagle Mountain for next years bruin adventure in the Maine wilds. For more on bear hunting - Bear Hunt to Extreme I and II and Smallest Bear Calibers. Also check out Bear Season 2010 Mixed Bag. 110 pounds is about the average and the average voter should carefully look at the size of a 110 pound bear. These guides and sports make this out to be rocket science with adrenaline thrown in, what a bogus charade for shooting animals feeding on human junk food. The word HUNT needs to be removed from anything these phonies do. I often wonder about the type of individual who finds solace in throwing rocks from the shadows. The fact that such negativity comes from an anonymous poster makes me seriously question that person’s integrity or at the very least their level of commitment to their own personal beliefs. Typically, I wouldn’t post a comment such as this, if the party wasn't willing to stand by their accusations by at least supplying some form of credentials, however, in this case I have granted an exception. I do this for I believe that there exists a lot of miscommunication and misdirection being created by the general populace simply because they are ignorant of many key factors related to bear hunting. First, everyone must decide on what the word trophy means to him or her. Personally, I have waited four years and passed on many bears in the 125-150 lb range waiting for a bear that would easily tip the scales at well over 200 lbs. For others a good bear means 110-150, which in my opinion is an “average” size bear. Would I like to see a client shoot a bigger bear . . . yes . . . who wouldn’t want them to shoot a larger animal! However, each person must make up his or her own mind on what constitutes an ethical size. Second is the fallacy that judging bear size, for the uninitiated, is easy. This is by far one of the hardest skills for a new bear hunter to master. I have personally hunted with dozens of professional level sportsman that misjudge bear weight by as much as 20-30%. Guides will frequently assist clients in estimating bear size by putting up markers, leaving 55 gallon drums and working extensively before the hunt to educate sports on what large bear look like in the woods. For example, big bears have large heads, small ears, roman noses, a confident gait, low hanging bellies, etc. Even with these attempts to inform hunters many still struggle to truly judge bear size. Lastly, baiting bears is the only way these animals would ever be taken in significant numbers to control their populations. Fair chase, stalking, stand hunting, etc. simply are ineffective. If curious to find out more check out the statistics that IFW post every year on the percentage of bears taken by these other methods. Two things come to mind when I read this comment. First, your reply enforces my belief that everyone should have a concealed weapons permit and be armed at all times. Second, if you hazard to compare tofu to bear meat then maybe I haven't given this soy product the fair assessment it apparently deserves. Be happy in the fact thy anonymous poster that you have badgered me into at least putting my lips to a meat substitute . . . no matter how vile and repulsed I may be by the thought. Looks to me like you have an HSUS supporter visiting your blog. I don't think I'll be changing my opinion of the tofu any time soon. Its still the same old soy junk its always been. These people who throw insults from the shadows, and believe that bear hunting over bait or with hounds isn't ethical, aren't sportsmen to begin with. First, they don't understand bears, their habits, habitat or their impact on the ecosystem as a whole. They don't understand our woods, our bear poulation or the responsibility we share as conservation-minded ethical hunters and guides. Hunters contibute more to conservation every year than HSUS, the Sierra Club and Wildlife Forever combined with the fortunes of radical land barons like Roxanne Quimby thrown into the mix. Look at the efforts of DU, NWTF, Rocky Mountain Elk Foundation and Backcountry Hunters and Anglers. And, just in case you radicals in the shadows are spying, here is a reminder for you; if you even think about interfering with a hunter's enjoyment of Maine's outdoors... Actively interfering with a person's hunt by engaging in noisemaking and similar actions is illegal in Maine, and we do know how to call a game warden or sheriff. Most people who work in law enforcement hunt, too. So good luck with that. Happy Hunting! Great Blog, keep it up! I cry out in pain, first for the animals that must die for Anon to enjoy his saintly tofu, and second I cry out from frustration that it was not I who got the bear. Bah! I can't believe you didn't say anything about the first heat wave in twenty years for our region, did you overlook that minor detail? From a Master Maine Guide. Bear killing is just that. There is no hunting concept. Put the bait in the barrel, put the hunter in a tree over the barrels that are being hit. Put the dogs on the bait pile and corner or tree a bear then kill it. Put the snare in a restricted pathway leading to the bait, then shoot the snared bear after hours struggling in the trap. The management of bear feeding has been disproven by states with more bears than Maine. Hounding and trapping are obviously not needed, just look at the numbers. As for the bulllarkey about hunters not killing enough bears that has been disproven as well. 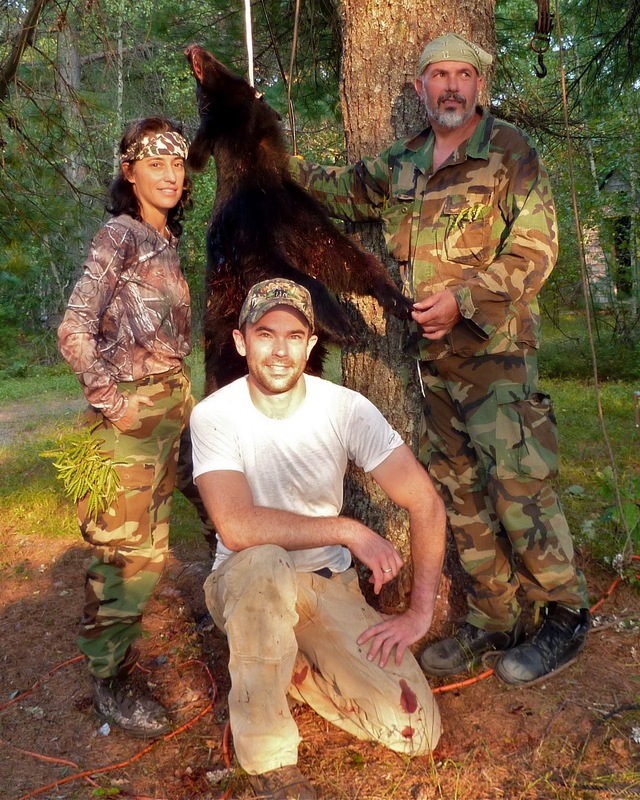 Of course baiters and the NON HUNTING CLIETELE they attract will argue against science and ethics because they have none, and the whole concept was created to make money by dispensing bears from big dumps to thousands of little ones all over the Maine woods. The myth of people like this being conservationists is ridiculous. RADICAL LAND BARONS? Plum Creek is a land baron and the whitetail deer yards have been chipped by these corporate jerks; Quimby is the least of our troubles. excuse me for not believing you when you say you are a "Master" Maine guide. If you feel this way about bear hunting. ALL of the guides I know that no matter what there is a "concept" and its more than just sitting on bait. CG . . . When I see a comment such as this I can plainly see it is time to get out the 10 foot pole . . . POKE, POKE, POKE!